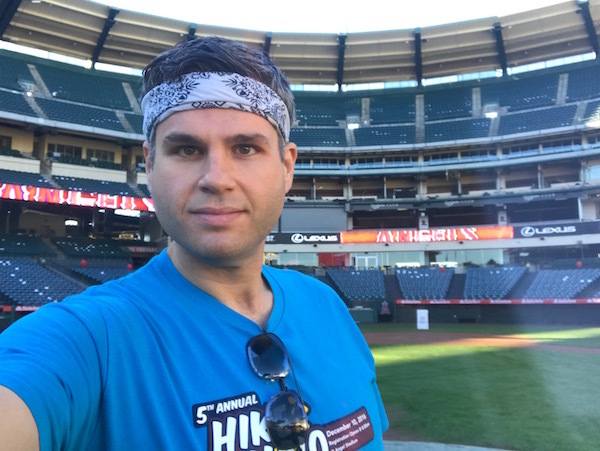 Anaheim | Keep It Up, David! 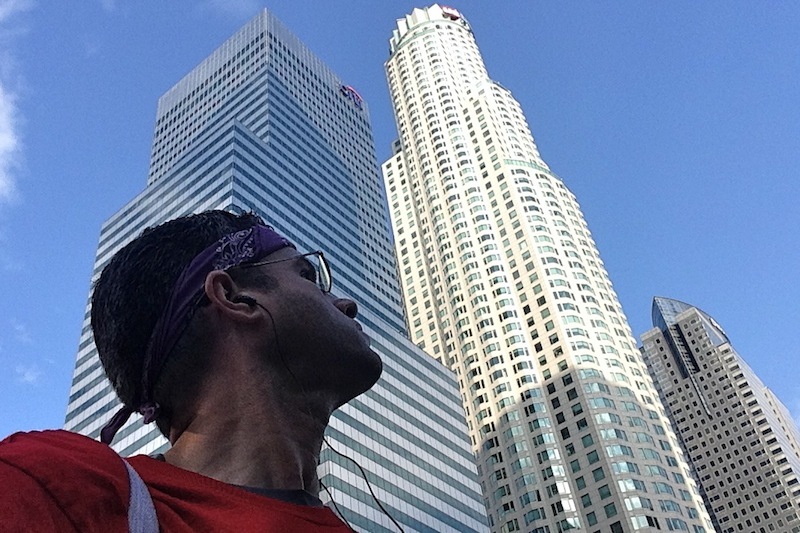 The end of the year is fast approaching, and I’m in the home stretch with my 2016 races. 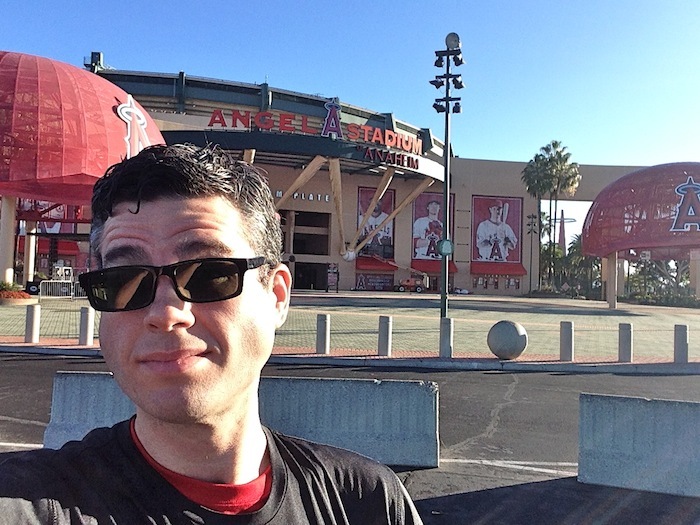 My last two are both in December, and the first was on Saturday, at Angel Stadium in Anaheim. Four Months. Four Races. I’m Racing Up Lots of Stairs This Fall! It has been a busy two days. Tonight, after work, I headed downtown to see a play. After getting home, I quickly changed and headed out for a run. It wasn’t a great run, but it was something, and when I add up the time spent running with the brisk walking warm-up and cool-down, I was on the streets for 45 minutes. I was antsy to go on the run, because yesterday ended up being a rest day. I didn’t work out before going to the office (I’ve been failing all week at morning exercise), and after work, I had dinner with an old friend from high school that was in town for a convention. And by ‘in town’ I mean Anaheim, which is an hour away, so when you factor in drive time, that left no time for a workout. I love theme parks. Love ’em! I love the rides, the atmosphere, the rides, the scenery, and the rides. 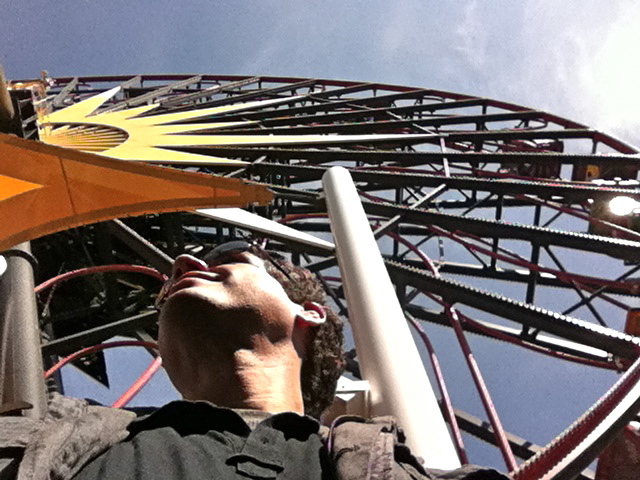 I’ve written pretty regularly about my theme park adventures on this blog. I debuted this blog with a post that recounted my first visit to Magic Mountain – a momentous occasion, since it was the first time that I wasn’t too big to fit on a roller coaster in almost a decade. 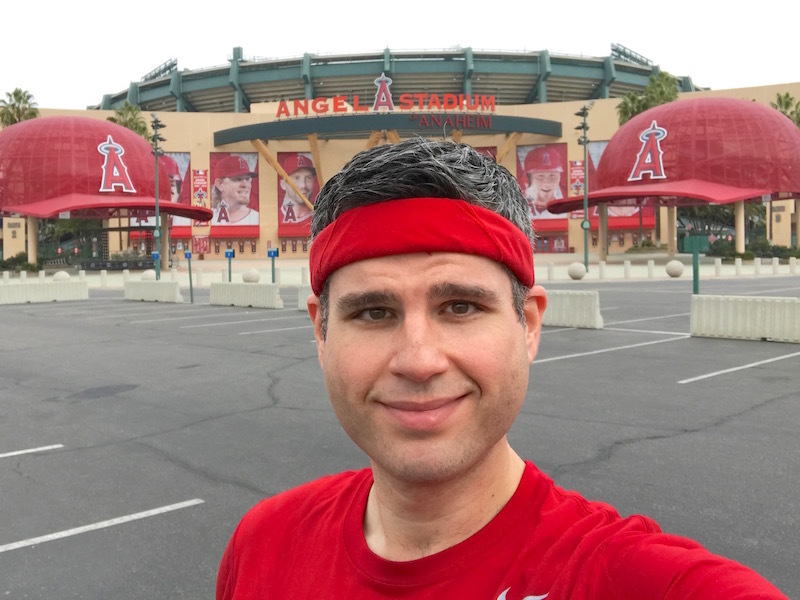 Since then, I’ve visited Knott’s Berry Farm and made a triumphant return to Cedar Point, the park I grew up visiting but hadn’t been to since college, when I was kicked off a ride because of my weight (details about that horrible experience here). At the end of January, I visited, for the first time, the most famous theme park in the world: Disneyland. I had a wonderful time with my friends Heidi, Tom, and Keith – click here to read about it and see pictures. I had gotten a good deal on a park ticket, too – Disney offers southern California residents a 2-day pass for $99 (a basic 1-day pass is $80). And that meant that I had to go back to Disney a second time before my pass expired in June. Luckily for me, there are two Disney theme parks in Anaheim. There’s the classic Disneyland, and the much newer Disney California Adventure, which is literally a few hundred feet away. 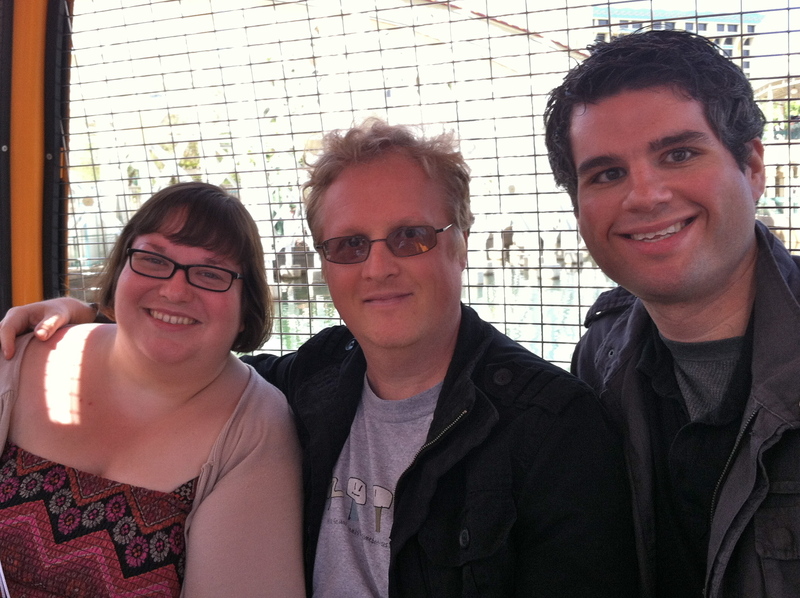 So on Monday, I gathered up Heidi, Tom and Keith again, and we checked out Disney California Adventure. I love a theme park I’ve never been to before! DCA opened about 10 years ago – it was built where the Disneyland parking lot used to be – and since I had never been there before, I had no idea what to expect. I had briefly heard about a few of the rides but knew very little about the park. Heidi and Keith are Disney junkies that know everything about everything – the perfect theme park companions! 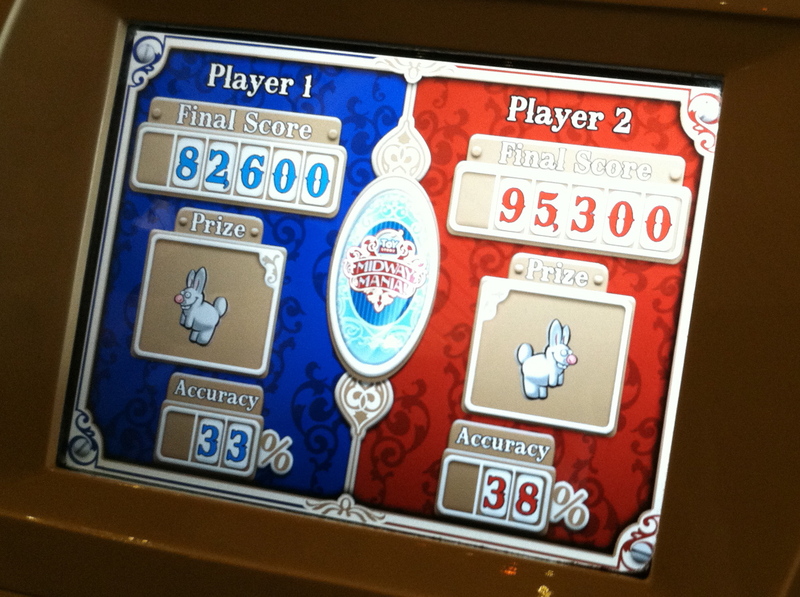 …and I won (I was Player 2)! Heidi, who was one car over, handily beat me by an additional 30,000 points or so. Well played, Heidi! While Toy Story Midway Mania was a blast, my favorite ride at DCA was Soarin’ Over California, where you sit in chairs that allow your feet to dangle. When the ride starts, the chairs get repositioned in front of a giant concave IMAX screen. There’s beautiful footage of scenery and landmarks from around California, and it comes together to make it seem like you’re hang gliding over all of it. The ride isn’t scary – it’s simply beautiful, and wonderfully done. I don’t have too many more pictures to share – I didn’t take many to begin with, and then my battery died halfway through the day (whoops). But I did photograph my lunch, because even though I was at a theme park, that didn’t mean I was going to make poor food choices. We ate at Paradise Garden Grill, which serves Mediterranean and Middle Eastern food – cuisines I’ve never seen in a theme park before! That’s a beef kofta skewer. 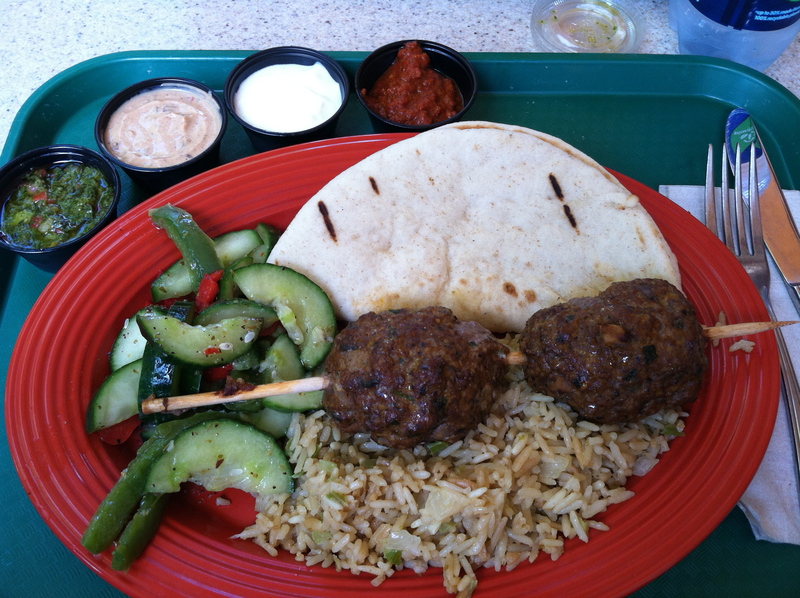 Kofta is basically a Middle Eastern spiced meatball. There’s cucumber salad, rice pilaf, and a piece of pita on the side. They offer 4 sauces, but I couldn’t pick just one, so I got all four to try. The white one was tzatziki (a yogurt and cucumber sauce), the green one was chimichurri (an Argentinean herb and oil-based sauce), and I forget what the other ones were, but I think one was a Moroccan-spiced chili sauce. Apart from the rides, we saw a couple really cool shows. DCA has a Broadway-style musical production of Aladdin that was well done, and, after the sun sets, the lagoon becomes home to World of Color, a very impressive, bright event that involves dancing fountains (like the Bellagio in Las Vegas) that shoot up walls of water that images and film clips are projected onto. I’m excited to go back to DCA at some point i the future – two big parts of the park were under construction (opening in June): a Cars Land (themed around the Pixar Cars movies), and Buena Vista Street, a tribute to Los Angeles in the 1920s, when Walt Disney first arrived in California. The best part about theme parks: I was walking all day long. Mile after mile after mile. Normally I’m very diligent about keeping track of my exercise, but every once in a while, it’s fun to have a very physical day (I was exhausted by the time I came home – we were there for around 11 hours!) and not worry about minutes or resistance levels or calories burned. This summer will mark my 10th anniversary of moving to southern California. In all that time, I never once went to one of the biggest, most iconic landmarks around. That’s right, ladies and gentleman, I’d never been to Disneyland. Ever. Until two days ago. There was no particular reason I had never been to Disneyland (I have been twice to Disney World in Florida, but not in 20 years), although I’m sure I had the notion, deep in my brain, that I couldn’t possibly enjoy it if I was too big to go on the rides. That’s not an issue anymore, so when I got the Disneyland itch last fall, I started really wanting to go. One of the big reasons I wanted to go to Disneyland is because some of my friends are giant Disney fans, and I realized that going with them would be a pretty special and fan outing. Heidi is one of those friends. Maybe you’re familiar with Heidi – she blogs over at Finishing the Hat (the title of this post, in fact, is in honor of her blog) – but she’s not just my friend from the blogosphere. I’ve known her since 1997, when we met at orientation before starting our freshman year at the University of Michigan. Heidi is a frequent Disneyland visitor – once every couple months or so, with periods in her life where she’s gone monthly. She knows a ton about Disneyland – in fact, she’s a self-proclaimed Disney nerd, and she jumped at the chance to show a first-time visitor around. I picked up Heidi and her husband Tom on Tuesday, and the three of us drove down to Anaheim. We talked park strategies on the way down, and, at one point, Heidi stopped me mid-question and asked, “David, are you going to want the full nerd tour when we get there?” I looked over and said, “Heidi, anything less than the full nerd tour would be a waste of time.” And I was serious. I’m going to Disneyland with an authority on the matter, so I wanted to learn as much as I possibly could! The full nerd tour was awesome. Heidi pointed out all the Disney hidden secrets – which building had the apartment Walt Disney lived in during the park’s construction (it’s above the Main Street Fire Station), the significance of this and that decorative feature, why certain rides had certain features that other rides didn’t. Let’s just let that soak in for a quick second: Keith has been to Disneyland over FIVE HUNDRED TIMES. He lives 15 minutes from Disneyland, and swings by a couple times a week. He’s there so often he’s been mistaken for a park employee before. He knows everything about everything. He knows when buildings get new paint jobs. He knows when the soundtracks to the parades get updated or revised. He knows how Splash Mountain in California is different from the one in Florida, down to ride mechanics and how the seats are configured on each log. It’s unbelievable, and, for someone like me who is naturally curious, enjoys learning, and appreciates other people’s passions, it’s completely fascinating. Keith is really cute, don’t you think? I do. Peter Pan, Snow White, Pinocchio, Mr. Toad’s Wild Ride, Alice in Wonderland, Roger Rabbit, Finding Nemo, Buzz Lightyear’s Astro Blasters, Space Mountain, Storybook Land Boats, Casey Jr. Circus Train, Pirates of the Caribbean, Haunted Mansion, Winnie the Pooh, Splash Mountain, Big Thunder Mountain, Indiana Jones, Jungle Cruise, and Star Tours. Heidi and Keith are going to be horrified that I botched most of those names. Nineteen rides – pretty sweet! We also saw the parade. OH – and I met a princess! This was a goal of mine. My 3-year-old niece Allison is obsessed with Disney princesses, and I wanted a picture with one to make her jealous (I’m such a good uncle, aren’t I?). Heidi and Keith warned me, multiple times, that the princesses were extremely popular, and that I should expect to wait an hour or more for the chance to meet and greet one. But twenty minutes into our day, what did we stumble upon? A row of princesses! Cinderella had the shortest line – I waited three minutes, and Heidi snapped this picture. Eat your heart out, Allison! Cinderella and I are total besties now. She asked me to say hello to Allison for her, which I did. I texted that photo to my sister Sarah, who reported back that Allison stared it for ten minutes straight. I can’t wait to go to Disneyland someday with her and her brother Sam! I gave Allison specific instructions to bug Mommy and Daddy every single day to visit Uncle David in California so we can go to Disneyland, so it’s just a matter of Allison being persistent and Mommy and Daddy caving in! My favorite ride was probably Pirates of the Caribbean, because it’s so grand in scale and atmospheric. I enjoyed most of the dark rides, because they’re a Disney specialty – you don’t see many of them at other theme parks. Peter Pan brought back childhood Disney World memories and has a special place in my heart, and I loved Pinocchio because it’s so eerie and disturbing. If you’re a longtime reader of this blog, you know I love roller coasters (read about my trips to Magic Mountain, Knott’s Berry Farm, and Cedar Point), and Big Thunder Mountain and Space Mountain are both well-themed, exciting rides. He only beat me by nearly 60,000 points. Big whoop. What a dumb, stupid ride. I’ve never going on it ever again. That’s salmon over mixed greens, corn salsa, orange segments, grapes, and caramelized onions, with a citrus dressing. And iced tea. I was pleasantly surprised with the food options at Disneyland. There’s all the unhealthy theme park options, like caramel corn and churros, but they also sold fresh fruit all over the place, and fresh veggies and hummus, too. Heidi mentioned that yogurt and a few other healthy options were available, too – so Disneyland gets lots of bonus points. Well said, Walt. It sure is! And now I’m completely blocking Tom. (Keep it up, David!) Naturally, Keith knew exactly where the cameras were placed on each ride, so I’m looking at him so I could copy his pose. But I obviously didn’t make it in time!